With a field of 45,000 runners, the Bank of America Chicago Marathon is one of the world's largest races. You don't need a qualifying time to enter, only fast fingers when registration opens. You get to run through a world-class city and see neighborhoods tour buses sometimes skip over. You have a course that's known for being flat, fast and PR-producing. This year when the 36th running of the Chicago Marathon gets underway on Sunday, October 13, there are more than a handful of elites to keep your eyes on over the 26.2 miles. Sure, each runner has a story for why he or she is running, and here are five that you might find interesting. Last year, Ritzenhein finished fourth at the U.S. Olympic marathon trials, squashing his hopes of competing in the distance in London. It was a blessing in disguise. Ritzenhein could focus on the 10,000 meters for the Olympics, and then roll all of that speed into Chicago Marathon training. Whatever Ritzenhein did after he returned from London worked: He ran a personal best at Chicago and has one of the fastest American marathoner times. The Michigan native hopes to have another good run Sunday. Even though she's from Baltimore, McFadden feels at home at the Chicago Marathon. It's where she debuted at the marathon distance in the wheelchair division (she has spina bifida). It's where she's won two years in a row. And it's where she hopes to three-peat as Chicago champion. If she does that, it'll also be her third World Major Marathon win this year after winning the Boston and London marathons a week apart in April. You can't miss her on Sunday: She'll be running ahead of the elites baring any chair issues. What hasn't Antonio done this year? He's become a faster runner. He qualified for a triathlon World Championship. He completed the Chicago Triathlon, which was practically a training day for Worlds. Now he's running the Chicago Marathon...again. But what makes Antonio's story even more special (and hopefully he doesn't mind that I phrase it that way) is that he has accomplished these feats with the help of some speedy guidance. Antonio is blind and requires the help of a guide as he swims, bikes and runs. He hopes to qualify for the Boston Marathon and he has local speedsters to help him. Earlier this year, the world met Allen as an overweight, once athletic contestant on The Biggest Loser. As season 14 stretched on, we watched Allen shrink in size and bust out crazy weight-loss numbers on the scale up until she was crowned the season's winner. Hailing from the Chicago area, one of the first things Allen said she wanted to do with her more-fit body was to run the Chicago Marathon. She ran the Shamrock Shuffle in April and finished the Rock 'n' Roll Chicago half marathon in July, and we'll see her tow the line in Grant Park again on Oct. 13. Nichols is lucky to be running. About 20 years ago he suffered an injury to his spinal cord that left him paralyzed from his neck down. He pushed through physical therapy for six years to reach a level of recovery that's nearly impossible for those with spinal cord injuries can reach. What's jaw-dropping is that Nichols finished his first Chicago Marathon in 2009 and then went on to run it again, and again, and again, finishing last year in 4:32, a time that many runners would love to attain. In July, Nichols received the Richard M. Daley and Maggie Daley Award, which honors the Bank of America Chicago Marathon participant who raises the most funds for charity through the event, for the $43,000 he raised for the Spinal Cord Injury Association of Illinois. Nichols will be back at it on Sunday, toeing the line for the fifth year in a row. 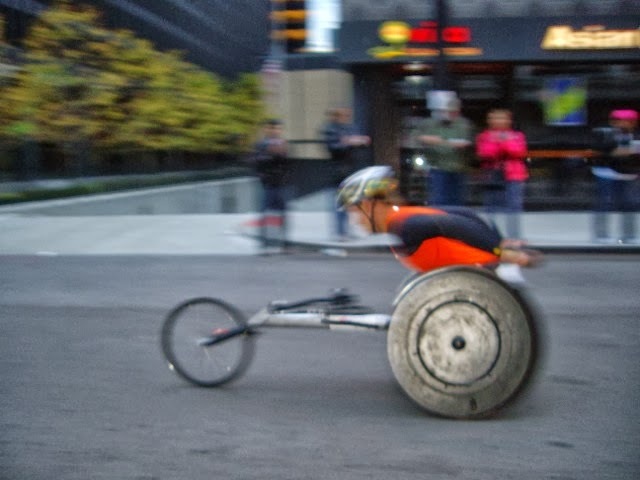 For more runner stories, check out the Bank of America Chicago marathon website. Photo from my mom, Susan Bongiovanni.